LEARN from the heart of Jesus. Our vision helps guide each member of our community on a path to becoming the best version of themselves: generous in spirit, courageous in their beliefs and awake to the presence and purpose of God in their lives. We constantly challenge all to reach beyond their comfort zone in learning and strive to extend their understanding and participation in the life of their local community and the wider world. The original school motto, depicted in Latin on the school shield, translates as ‘All for the Honour and Glory of God’. Within the context of education in the 21st century we have adapted this to ‘we inspire, challenge and nurture’. These actions are key aspects of all we do in the day-to-day life of our community. St Bede’s School is the longest continuously running Catholic school in our Archdiocese. Established in 1859, we have provided education in the Catholic tradition for young people in the Braidwood district for over 150 years. 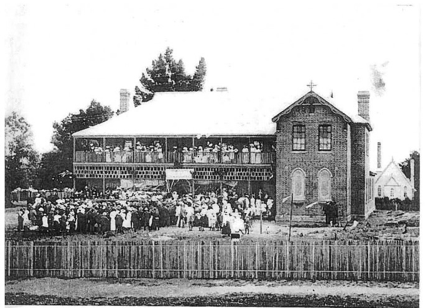 For 97 of those years the Sisters of the Good Samaritan led and taught the children and today their proud tradition continues through the provision of contemporary, student-centred teaching and learning programs. The school was originally located on the corner of Lascelles and Wallace Streets, beside the church. The old slab hut was moved to the school’s current location in the early 20th Century. The two-storey building was opened in 1917 and the slab building was replaced in 1948. The original building is now a hay shed on the Kings Highway! A new library building was erected in 2008 and major renovations in 2015 and 2017 continue to meet the needs of an expanding school population. In 2014 St. Bede’s School held it’s 150th anniversary, a major milestone in consistently providing Catholic education for the region.